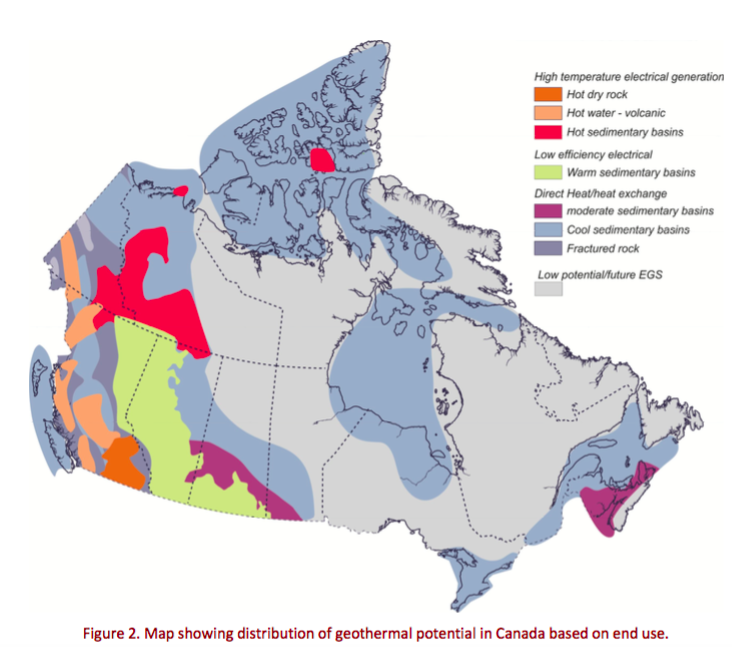 The potential for geothermal energy in Canada is immense- it is estimated at over 5,000 MW in traditional shallow geothermal resources with currently available technology. Altogether, this level of geothermal energy production could create approximately 8,500 operations and maintenance jobs as well as 20,000 part time construction jobs. 5,000 MW of baseload geothermal power is also able to displace an equivalent amount of coal fired power which would yield more than 25 mega tonnes (Mt) of offset CO2 emissions per year. In addition, upwards of 10,000 MW or more may be available in deep geothermal resources, which require enhanced geothermal systems (EGS) whose technology is still under development. This abundant source of clean, reliable energy can fortify Canada’s domestic energy supply and support energy exports to markets demanding clean, renewable energy, such as the United States. As well, geothermal power is well suited to address the needs of northern and remote communities as it can provide electricity while also providing heat energy for space heating in residential or commercial applications such as green houses that grow local produce. Geothermal energy can free these communities from their reliance upon fuel imports for power and heating needs. As Canada moves to eliminate GHG emissions by 2100, clean renewable energy will play an increasingly important role. Thus, the development of Canada’s geothermal resources is becoming increasingly attractive. In light of Canada’s abundant naturally occurring hot springs and pools, geothermal energy has surfaced as an ideal candidate to provide base-load, renewable energy for Canadians and export markets. With further support from federal, provincial, and municipal governments, imagine the role geothermal energy could play in satisfying our clean energy demands. CanGEA is leading the charge to influence effective policy at all levels to enhance the development of Canada’s indigenous geothermal resources. Together, CanGEA and its members are pioneering the exploration and development of Canada’s tremendous resource of subsurface energy.